Beamish is an immense open-air living history museum in the North of England. I had the great pleasure to be driven there by a friend of mine from York and spent a gleeful day exploring the many buildings of the site. I visited in mid-January 2018, on a Saturday, and was shocked and pleased at both the number of visitors and costumed staff in what I would traditionally consider the off-season for such sites. Beamish makes a strong case for the potential to have these sites open year round, if the demand is there! Beamish portrays several different time periods, all separated by some distance along a road. Each is its own self-contained little village or manor house. They are: a house, church, and grounds from the 1820s; a village of coal miners in the early 1900s; a prosperous town in the 1910s; and a farm community in the 1940s – the home front of the Second World War. The site is very good at providing an immersive experience and evoking the feeling of Northern England during the time periods they portray. A teamster cleans a horse’s harness. A miner’s widow in one of the worker’s houses on Francis Street. One of the friendly conductors on the double-decker streetcar. A man speaks about aerated water in W Smith’s Chemist, 1910s. Two interpreters in the house of a miner’s family on Francis Street. A member of the Home Guard (WWII) speaks with a visitor. Overall, I was very impressed by the depth of knowledge their costumed interpreters had, and they inhabited their spaces as historical figures would, going about their daily tasks, including unpleasant ones like scrubbing tables. It didn’t feel like they were lying in wait for visitors to show up. They were almost always embroiled in a particular task when I encountered them, really providing an immersive experience for me as a visitor. I heard costumed staff interpret in many different character styles. Some were entirely first person, fully in-character, such as a dentist in the 1910s who explained the latest in anesthetic breakthroughs to me. Others were in third person (“this is where coal workers would live in 1900…”), providing clear but interesting information about the site. I was very interested to hear where buildings had originally come from, for example, and how many were deconstructed and rebuilt stone by stone in their new location. Other interpreters used a mix of the two styles, breaking character if necessary, or employing hypotheticals such as “I would have used a machine like this to…” There was an excellent mix and I was always learning something new! Interpreters really do bring sites like Beamish alive. There were quite a few small restaurants throughout the site, so we had no difficulty satisfying our Maslow’s Hierarchy of Needs and finding a place to eat. My friend and I ate lunch at the British Kitchen (in the 1940s), which I am given to understand would have been a typical type of establishment during that decade. They really worked the wartime rationing theme, something I find a fascinating part of British history at that time that didn’t have as strong an impact on Canadian history during the same decade. Plus, their food was absolutely delicious and not too pricey! (Also, I as a Canadian didn’t know that Bovril wasn’t just a base for a broth or sauce but can actually be drunk as a hot beef flavoured drink?) We also had a pint of locally brewed beer at a pub called the Sun Inn, which is a fully functioning bar in their 1910s street. I love that their eating establishments also provided an immersive visitor experience, serving food and drink roughly equivalent to that served in the time periods they represented. Why go for generic hot dogs and hamburgers when you can use restaurants to reinforce the themes and aesthetic of your historic site? Beamish is a large site. There is a ring road that goes around to the different time periods, but it can take 10 or 15 minutes to walk from place to place. In the summertime, I am told there is a steam train, which wasn’t running when I was there in January. However, even in winter there were historical double-decker busses and streetcars running very frequently for visitors to use. There was no additional cost on top of admission to use historical public transit on site. Also, there are great views of the different historical buildings from the top of these amazing vehicles. One of the things I was super impressed by at Beamish was that they have their artifact storage space open to the public. Highlights for me include an iron lung, used by polio patients! They’re also currently gathering artifacts from the 1950s for an additional area of the site currently being developed and not yet open to the public. I suppose I’ll have to return in a few years to learn more about the 1950s! In many respects, there were elements of Beamish that reminded me strongly of the narratives we tell in historic sites in North America, such as the hardships of the past (though minus the typical new world pioneer narratives), feelings of community, and changing technologies and social mores through time. A lot of the daily activities portrayed on site were not unexpected, though they were handled expertly by the costumed staff: handicrafts like rug making and quilting, cooking in wood burning stoves, and caring for livestock. Many artifacts, too, were familiar to me from my time as a historical interpreter at Fort Edmonton Park. But one of the things I’d never seen before at any other historic site are gigantic cheese presses. I found several of them at Beamish and I’m not entirely sure what they’re for. Something to do with the cheese making process? I imagine that they’re the kind of artifacts that do survive the centuries relatively intact, being large in size and solid in construction. This odd-looking gate outside Eston Church in the 1820s area may be made from a whale’s jawbone. One of many fascinating things to see at Beamish! Even though my friend and I arrived only 10 minutes after the park opened in the morning and stayed until just before closing time, I feel we only got a brief overview of the site. I think it would take several days to truly explore and get a real sense of the place. If you find yourself in Northern England, I highly recommend you step into the past and visit Beamish. Last fall, I was approached by historical fiction author Elizabeth Hutchison Bernard to review the manuscript of her historical suspense novel, The Beauty Doctor. She had already done a tremendous amount of research but needed someone to help her fill in a few gaps as well as to ensure that she had accurately captured some of the nuances of the Edwardian era. In particular, she was concerned about subtle differences between the Victorian period, about which there has been so much written, and the Edwardian period, which was relatively short but did represent a huge shift in certain aspects of American life and culture. I soon fell into a rabbit hole of research, exploring the fascinating world of early plastic surgery and gender politics in 1907. Conducting research for a novel, as opposed to many academic articles, had me seek out interesting details of daily life that aren’t often recorded. (Do you make note of which streets in your town are paved or unpaved? What about if there are electric street lights on the corner of your street? Did you change your clothes before you went out for a walk this afternoon, or not?) Luckily for me, the action of the novel largely takes places in New York City, one of the most documented cities in the world! Still, some details remained elusive. The Edwardian era was a time of flux when it came to technology as well as social values: an excellent backdrop for a historical drama! How do you start a car at this time? 1907 was very early in the history of automobiles, and they were largely considered playthings for the rich – and they were dangerous. One of my favourite sources for perceptions of cars in the early days was this podcast episode from 99% Invisible. But how do you operate a car from this time period? It was far from standardized like it is today. My best source was to simply go on youtube and watch people start vintage cars like this one. A picture – or video – is worth a thousand words! What kinds of clothing would a character wear on particular kinds of occasions? What a character wears says a lot about them as a person, and it will change depending on the situation they find themselves in. Reading historical etiquette manuals helped me get into the mindset of what was appropriate and inappropriate to wear – and remember, not all characters act according to society’s wishes. This was something that the author and I discussed frequently, as she had very definite ideas about what some of her characters should and should not do or wear. I found that her instincts about such things were quite good. For example, her character Alexandra Gagarin, the Russian countess, often wore a kimono; the Asian influence actually was quite in vogue at the time. I found collections of historical fashion plates invaluable, particularly for characters from higher classes. Mail order catalogues are also very handy to see what an everyday person could buy, ready-made, and that’s not just limited to clothing! Of course, photographs of women and what they really wore, as opposed to illustrated fashion plates, are also incredibly useful, and fascinating to boot. Would they have said it like that? How do you check and see if a word was in use over 100 years ago? The author had actually been very careful about her selection of words and researched the origins of most all of them that were questionable. However, a second pair of eyes is always a good idea! I’d often reach for two different resources to confirm or deny my gut feeling of a word or phrase sounding too modern. Google Ngram is a nifty tool that allows you to search Google Books for the prevalence of words or phrases over time, and displays them in chart form. Here, for example, is a graph depicting the published use of the phrase “makes them tick” in published material. (It seemed to come into popular use after the Second World War.) This online etymology dictionary was incredibly handy to see when a word first joined the English language and how it has evolved over the centuries. I learned, for example, that the word “concussion” has a long history: “c. 1400, from Latin concussionem (nominative concussio) “a shaking,” noun of action from past participle stem of concutere “shake violently,” from com “with, together” (see com-) + quatere “to shake” (see quash). Modern brain injury sense is from 1540s.” A lot of words that I checked because they felt too modern to me turned out to have older origins than I anticipated! The word “boss” dates from the 1640s. The word “handy” dates back to the 1300s! And sometimes it’s just the way a word sounds, rather than its date of origin. For example, the author liked my suggestion to use the word “position” instead of “job.” Either would have been perfectly correct, but the former has a more old-fashioned “ring” to it. As for the medical aspects of the book, especially plastic surgery, the author was quite an expert in that herself. She did, however, ask for my help in finding some photos of operating rooms from the first decade of the 20th century, including how the doctors and nurses dressed. Of course, most of the medical scenes in The Beauty Doctor don’t take place in a hospital but instead in a private doctor’s office set up as an operating room. There was definitely some improvisation required! I really enjoyed the story of The Beauty Doctor and think you will, too. The book is available now through these fine retailers! Charles Allard Jr. (an expert cowboy and the son of the original co-owner of the herd) was such a badass he had a habit of “hurdling” fences instead of taking the time to walk around to the nearest gate like everyone else. Apparently the busiest guy at the roundup was Jim, Allard’s Japanese cook? Interspersed throughout the text are cropped photographs from Norman Luxton of Banff. These full-sized images were recently reproduced in Harvey Locke’s book, The Last of the Buffalo Return to the Wild, so I recognized them immediately. A poor quality scan of the original souvenir pamphlet with the images can be seen here on Peel’s Prairie Provinces if you can’t reach for your copy of Locke’s book on your shelf. (Do you have a birthday coming up? Ask for a copy! Totally worth it!) Anyway, what I found absolutely thrilling was what the Edmonton Bulletin article said about a woman named Mrs. Irvine. The caption beneath the image on the far left says “Mrs Irvine. This remarkable old lady who was the heroine of the round up, in spite of the fact that she was a grandmother, rode over seventy-five miles one day through a wild and broken country. She was accompanied by her grand-daughters, the Misses Marion, of Lethbridge.” Screenshot from Peel’s Prairie Provinces. I, with my modern mindset, can only call her a badass. Mrs. Irvine’s picture does appear in the pamphlet The Last of the Buffalo. You can compare the image above with the copy in The Last of the Buffalo here. However, the caption in the facsimile in Locke’s book merely reads “an Indian woman.” This dissatisfying caption, all too common in historical images of Indigenous people, completely erases her remarkableness. She becomes anonymous – an out-of-context hanger-on with no clear relationship to the bison roundup aside from the implicit cultural link between Indigenous people and bison. With the context from the contemporary newspaper article, we learn her name, that she had a personal family connection with the herd, and that she was a badass that participated in the roundup for fun and because it was important to her. Bison being unloaded at Buffalo National Park. Were any of these once herded by Mrs. Irvine? PC005103. Image courtesy of Peel’s Prairie Provinces. This is a classic example of why initiatives like Project Naming are so impactful. Project Naming aims to circulate images of Indigenous people in archives among people who may be able to identify the people pictured. By reconnecting the people in these historical photographs with their names and identities, you can reconnect these images to existing communities. The image then becomes not just that of an “Eskimo trader”, but that of an Inuk man, perhaps an uncle or grandfather of people who are still alive and who may never have seen this photograph of their relative or friend. Historically, many people publishing images of Indigenous people, particularly women, didn’t think it important to list their names – even if every other person in the image (white folks) did have their names recorded. By reproducing this image with the caption “an Indian woman”, the publisher stripped this woman of her identity, erasing her remarkable story from the narrative of this round-up. Names matter. These stories should not be lost. Remember Mrs. Irvine. Tell the story of how a grandmother rode for seventy-five miles in one day after bison her brother-in-law helped to save and raise. Tell the story of how her hunting dogs fought a bull bison and won. Tell the story of how she prevented a stampede. And tell the story of how one day she corralled a bison that dozens of other “dare-devil” male riders could not. Remember Mrs. Irvine’s name and story. Locke, Harvey. The Last of the Buffalo Return to the Wild. Banff: Summerthought Publishing, 2016. “The Round Up of the Second Herd of Pablo’s Buffalo,” Edmonton Bulletin, November 8, 1907. This isn’t Pink Eye (photo is circa 1930) – but it is a photograph of the current “King of the Herd.” PC006887. Photograph courtesy of Peel’s Prairie Provinces. “Pink Eye has been called upon to defend his throne against only one serious revolutionary movement of a pretender since the herd entered the park. In this fierce battle he was returned victorious – not unscarred, but with a deeper rumble to his bellow, and a more dangerous gleam in his eye. It was a fierce battle. The scene of it was on the top of a knoll, which capped a rise overlooking the lake. The bull who essayed to oust Pink Eye from command of the herd was a giant himself, but young and inexperienced, unversed in the plan of battle. The keepers say the fire of the approaching battle had been smouldering for some days. Pink Eye was loathe to engage in it, but when the point was reached where his dignity could suffer no further insult and permit him retaining his prestige, he gave battle. Excerpt from “The Buffalo at Elk Park,” The Edmonton Bulletin (August 29, 1908): page 3. This (probably) isn’t an image of old Pink Eye either, but I like to think the rage in his eyes is the same. Photograph of a bull bison from the Pablo-Allard herd being loaded up in Montana on his way to being shipped up to Elk Island, circa 1909. “Buffalo Refuses to be Unloaded,” by N.A. Forsyth. Image from the Montana Historical Society. Other times, plaques are so far off the beaten track you have to wonder what their intended audience was. Such is the case of this plaque at Elk Island National Park. The plaque is firmly secured to a glacial erratic – a large boulder. It does mark the site of the cabin, but the site is so far out of the way the plaque can’t be seen by more than a dozen or two people a year, largely park staff. You see, it sits along what’s known as Rob’s Road: a disused warden trail in the little-used Wood Bison Area of the park. It is technically accessible to visitors, but would be a 20km hike or so along an unofficial trail. I think bison see it more often than people do. Nevertheless, it is a pleasant surprise to stumble across this little memorial! Do continue five minute’s north along the path. You’ll see the only two maple trees in the entire park, planted alongside a different warden cabin, now gone. Want to know where to find this plaque? See the map on this entry of ReadThePlaque.com. W.H. Stephens and “Black Jack” Sanderson are briefly mentioned on page 95 of Graham A. MacDonald’s Beaver Hills Country. My entry for this memorial on ReadThePlaque.com. Consider contributing a few entries of your own with your local plaques! Elk Island National Park: What’s in a Name? Beautiful Elk Island National Park! But where did its name come from? Is there an Elk Island on the lake? Or is it all a beautiful metaphor? When I first arrived at Elk Island in 2014, I went searching for the origins of the park’s name. The “elk” part of the park’s name made intuitive sense, as it is pretty well-established that Elk Island had been founded as a federally controlled elk preserve in 1906. But where did the “Island” in its name come from? Yes, there was an island on Astotin Lake called “Elk Island”, but it is now a peninsula. That name came later, though, and it is so called because elk apparently used to swim out there to give birth. So no, that island wasn’t important enough to name the entire park after it. Image courtesy of Parks Canada. Visitor guides from the 1980s seemed to go the metaphor route. Judith Cornish wrote in Finding Birds in Elk Island National Park (1988): “Elk Island – an island of wilderness in a sea of rural development.” Jean Burgess in Walk on the Wild Side: An All Season Trail Guide to Elk Island National Park (1986) also described the park in its introduction as an “‘island’ of wilderness.” I’ve heard ecologists talk about how the Beaver Hills, where the park is found, are like an island of unique geology, rising up above the surrounding landscape. That may well be true, but is it where the park’s name came from? I had read early newspapers that called the place “Elk Park” before it became a dominion park with the Dominion Parks Act of 1913, at which point it became “Elk Island Dominion Park.” Why the addition of the word “Island” at that time? So I did what any historian would have done… I looked it up. “Elk Island Lake Park: One of the Beauty Spots of Alberta,” Saturday News (January 25, 1908): 1. Island Lake in Elk Park, Fort Saskatchewan, Alberta, circa 1910. Image courtesy of Peel’s Prairie Provinces. From 1906 to 1922 (when the park expanded its borders to what is now the Yellowhead highway) the park was a little fenced postage stamp of land around Astotin (Island) Lake with a bunch of elk. People came to admire the park’s two distinctive features: the elk and the islands. Hence: Elk Island National Park. Also, the name “Buffalo National Park” was already taken. “Last Buffalo Chase in America,” by N.A. Forsyth. Image from the Montana Historical Society. As visitors to this blog may note, I never get tired of stories of bison, past and present. I was recently trying to track down some images of the roundup of bison in Montana from the Pablo-Allard herd – the bison that were sold and shipped North to Canada to Elk Island National Park in 1907-1909. The last great roundup of wild bison was quite the media event and newspapers in Montana and Alberta are full of epic death-defying stories. One of the men on the scene to document this event was N.A. Forsyth, who took a large number of stereoscope images of the “Buffalo Roundup.” A while back, I ran across this story of how he nearly died for his craft in a Wainwright, Alberta newspaper. Source: Wainwright Star, January 8, 1909, Page 1, Item Ar00104, at Peel’s Prairie Provinces. Recently, I discovered the digitized collection of this photographer’s images in the collection of the Montana Historical Society… and one image really struck me. I believe that this photograph may well have been taken only moments before the photographer was nearly trampled half to death. Several details stick out. “After the Swim, Herd of Wild Buffaloes, Mont.” by N. A. Forsyth. Image from the Montana Historical Society. Firstly, the description of the scene: bison swimming across a river, near some trees, but the photographer was out of the perceived path of the herd. He was near some trees, which he clung to as the bison went by not once but twice. Secondly, the reference to “two costly cameras.” Why would he need two cameras? To take stereoscopic images like this one. You need two lenses to create two near-identical photographs simultaneously – hence, two cameras. Though if they were smashed, would that necessarily ruin the film…? Anyway, perhaps I am wrong. Maybe this photograph wasn’t taken right before this photographer was nearly stampeded by bison. I can tell you for certain that this photograph was taken by the same photographer of the same herd of Michel Pablo’s bison, and based on his photographs he didn’t always stay a safe distance away from these wild animals. Here is a selection of more photographs Forsyth took of the roundup. These are all stereoscopes. With a special reader, these photographs would have appeared 3D, so you too could experience the Great Buffalo Roundup from the comfort of your own home! All of these images are from the Montana Historical Society. Please click on the images to follow the link to the archive’s page to zoom in on high definition digital scans of these stereoscopes. “A Buffalo Calf Six Months Old,” by N.A. Forsyth. Image from the Montana Historical Society. “A Fine Pair in the World’s Finest Buffalo Herd,” by N.A. Forsyth. Image from the Montana Historical Society. “Bringing in a Bunch to Load,” by N.A. Forsyth. Image from the Montana Historical Society. “Buffalo Escaping from Wagon,” by N.A. Forsyth. Image from the Montana Historical Society. “A Very Mad Little Buffalo,” by N.A. Forsyth. Image from the Montana Historical Society. “Buffalo Refuses to Be Unloaded,” by N.A. Forsyth. Image from the Montana Historical Society. “A Buffalo is Good on the Turn,” by N.A. Forsyth. Image from the Montana Historical Society. “Buffaloes Roll Like a Horse,” by N.A. Forsyth. Image from the Montana Historical Society. “Subdued Prisoners Waiting for Their Exile,” by N.A. Forsyth. Image from the Montana Historical Society. “The Great-Grandmother of the Herd,” by N.A. Forsyth. Image from the Montana Historical Society. “Making a Last and Fierce Struggle for Freedom,” by N.A. Forsyth. Image from the Montana Historical Society. Note that this escapee is in fact a female bison. Newspapers said that Pablo had to specially reinforce cattle cars because bison would burst right through the sides of normal cow cars. Elk Island National Park: Founded on a Bet? It’s no secret that I’ve been doing a lot of research into Elk Island National Park’s history recently for work. One of the things that I could never quite wrap my head around is the motivations for the foundation of the park in 1906. Elk Island is one of the oldest national parks in Canada – it in fact predates the foundation of the more famous Jasper National Park by a year – and is the only remaining example of an “Animal Park,” founded as it was to protect one animal species (elk). Other national parks, like Banff, were considered “Scenic Parks,” founded to protect their beautiful scenery from logging and settlement and to encourage tourism. (The other two “animal parks” in Canada, incidentally, were Buffalo National Park (1909-1939) and Nemiskam National Antelope Park (1915-1947).) Elk Island has over a century of conservation history under its metaphorical belt, starting with the preservation of a small band of elk enclosed by a fence. But what motivated the creation of the only entirely fenced national park in Canada? 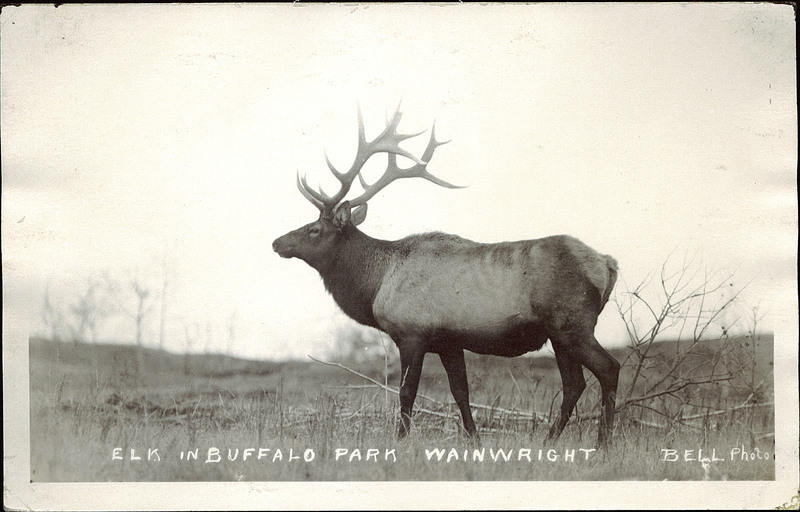 Elk in Buffalo Park, Wainwright, Bell Photo, circa 1910. Courtesy of Peel’s Prairie Provinces. The basic outline of the story that I was always told by other park employees and in short trail guides from the 1980s was that Elk Island was founded by “five guys who put up a $5,000 bond.” I’m going to be honest with you: I had no idea what that meant. When pressed, colleagues explained to me vaguely that five conservation-minded men from Fort Saskatchewan asked the government to create a national park and pooled their resources to show that they were serious in their commitment, and that the government matched that $5,000. Not knowing much about Edwardian bonds or the financial situation of the Canadian government in 1906, and not knowing what the money was even for, I wasn’t sure if this made sense. I was really left with more questions than answers. Doing a little digging, it turns out that those five men from Fort Saskatchewan were all members of a hunting club. I knew that middle- and upper-class hunters from settler communities were often involved in early conservation efforts in the Victorian and Edwardian eras, largely because they wanted large game to be managed for their own benefit and protected from the being killed by local people (largely Aboriginal and/or poor) for subsistence. The early history of national parks in North America as a whole is riddled with stories like this: more privileged “visionaries” reserving tracts of land from those who lived on and used that land already. This interpretation fits with descriptions of the Fort Saskatchewan men being concerned that unnamed people would shoot the last remaining elk in the region. “Alberta Game Laws Changed: The Proposed Elk Park – No More Spring Shooting,” Edmonton Bulletin (May 3, 1906), 1. Courtesy of Peel’s Prairie Provinces. And thus Elk Park was born. Three sides of the fenced enclosure were built around Astotin Lake by volunteers, leaving the southern boundary open. Elk were driven into this area, and the fourth fence constructed soon after, enclosing a grand total of about 24 elk in June 1907. After that point the five men were “released” from their bond as they had fulfilled their obligations. Now, I interpret this incident almost as if it were a formalized “bet”: the Minister of the Interior, Frank Oliver, didn’t believe that it was feasible to enclose this band of elk. The residents of Fort Saskatchewan disagreed. $5,000 was put forward by five men as a guarantee that they was serious about protecting these elk, and Oliver would set aside land for them to try to enclose the animals. If the five men were right, Oliver would make the fenced enclosure officially a national park (or protected game reserve). The residents, in the end, succeeded, and Elk Park was quietly managed as if it were a national park until it was officially designated one under the Dominion Parks Act in 1913. That does of course make me wonder, though: what if they’d failed to enclose the elk? Would “Elk Park” have been quietly re-absorbed into the Cooking Lake Forest Reserve from which it was carved out? Regardless, the narrative of “far sighted, visionary conservationists” founding the park in 1906 never sat well with me. It always seemed like an idealization of the past or a romanticize of its founders. It’s a truism that people do things for selfish reasons. More research into this specific situation bore this assumption of mine out. It appears that one of the five men, a Mr. Lees, was awarded two contracts totalling $13,800 in 1906 to construct that fence. (Fence posts and wire are expensive.) He more than made up his temporary investment of a portion of that $5,000 bond. But see, the thing is: just because national parks were founded for quote-unquote “selfish” reasons does not negate the century-long conservation legacy that came afterwards. Origins are not destiny. I think that telling a more nuanced, “warts and all” story is far more fascinating and provides a deeper understanding than a glossy soundbite about historical “visionaries”. Whatever their intentions – be it personal profit, a desire to reserve those elk for their own hunts, or an actual desire to see elk protected from harm at the hands of human beings – those five men did secure the protection of the last remaining significant elk herd in the Edmonton area, and the park that they helped to found went on to play a huge role in preserving plains and wood bison from extinction in the future. And that’s worth celebrating. “Alberta Game Laws Changed: The Proposed Elk Park – No More Spring Shooting,” Edmonton Bulletin (May 3, 1906), 1. Hart, E.J. J.B Harkin: Father of Canada’s National Parks. Edmonton: University of Alberta Press, 2010. Scace, Robert. Elk Island National Park: A Cultural History. Unpublished report prepared for Parks Canada Department of Indian & Northern Affairs. Calgary: Scace & Associates Ltd., 1976. By 1890, the once great wild North American bison herds, which had at one point numbered in the tens of millions, were all but extinguished. Within a single human lifetime of slaughter, less than a thousand individuals were left, scattered across North America in small pockets. A few wild bison remained in areas which became national parks: plains bison in Yellowstone (1872) and wood bison in Wood Buffalo (1922). Most of the remaining stragglers elsewhere were soon after hunted down or captured by ranchers. 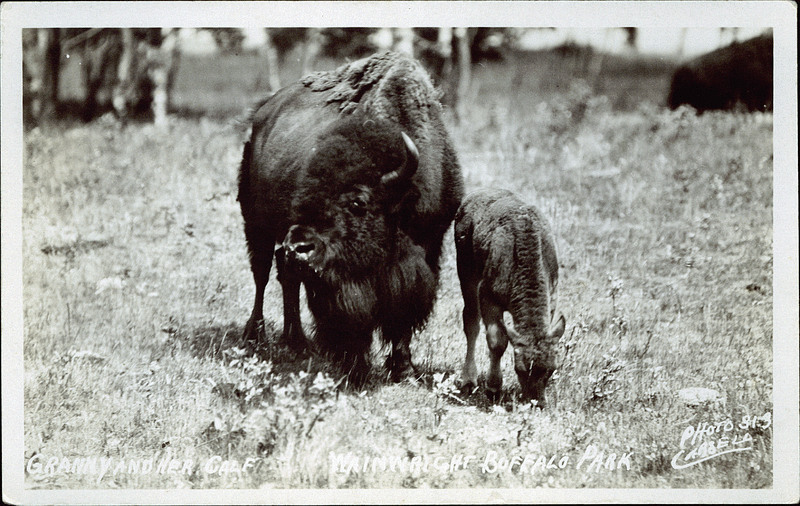 “Granny and her calf, Wainwright Buffalo Park.” Wainwright: Photo Carsell, 1931. PC005137. Image Courtesy of Peel’s Prairie Provinces. In the 1870s, during one of the last great buffalo hunts in Montana, a First Nations man named Samuel Walking Coyote captured and raised about four orphaned calves after they followed his horse home. After his herd had grown to about thirteen head, he sold them to two Métis men: Charles Allard and Michel Pablo. Pablo and Allard raised these animals over the next few decades, bolstering their stock with animals from other sources such as Charles “Buffalo” Jones. But by the turn of the century, Pablo (Allard had since died) lost the right to graze his bison on the Flathead reservation land where they’d been flourishing because the American government decided to open up native reserve land in the area for white settlement. Pablo offered to sell his bison – a symbol of the American West – to Teddy Roosevelt’s government, but they vacillated and couldn’t commit. Some say Pablo felt personally insulted and when the Canadian government agreed to buy his bison he went out of his way to ensure that every last animal possible would be sent north above the Medicine Line (the 49th parallel) to Canada. The roundup was to be no easy task. You try moving over 700 of these guys somewhere they don’t want to go. 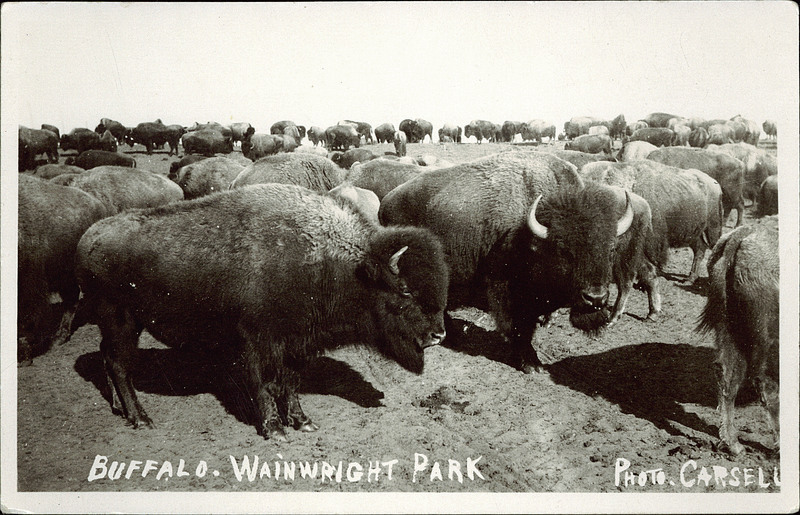 Image of bison at Buffalo National Park at Wainwright (descendants of the Pablo-Allard herd) in 1931. PC005106, courtesy of Peel’s Prairie Provinces. Pablo had underestimated the number of bison that he actually grazed: instead of perhaps 300, he had over 700. The bison were temporarily housed at Elk Island National Park from 1907-1909, because the fences at the newly-created (and ill-fated) Buffalo National Park, were not completed until 1909. But those are stories for another time. Rounding up all of Pablo’s bison took far more than the one summer they had planned, but due to the tenacity of the cowboys on horseback working over the course of nearly five years over rugged terrain with the largest and wildest of remaining bison herds, and the significant financial investment Pablo made in wooden corrals and specialized, reinforced train cars, Pablo succeeded in his goal. Bison are still rounded-up today. For the past century, Elk Island National Park has actively handled bison for disease control, population reduction (earlier through culling and now through transfers), and sample taking for academic study. It is no easy task. Last week, I had the amazing opportunity to help with the roundup of wood bison: the largest land mammals in North America. After over a century of work, the conservation of plains and wood bison continues today. Splitting the bison herd into a more manageable number of individuals to run through the squeeze. Photo courtesy of Scott Mair. At the ready at the single chutes, waiting for a bison to come through so we can close the gates behind them. Photo by Scott Mair. At the single chutes. (There I am!) Photo by Scott Mair. Wood bison in the handling pen. Photo by Scott Mair. The last of the buffalo: Comprising a history of the buffalo herd of the Flathead reservation and an account of the great round up. Winnipeg: Stovel Co, 1908. For some amazing shots of old-fashioned bison handling, circa 1985, and for more history of the Pablo-Allard herd and Buffalo National Park, see these two NFB documentaries (full-length versions available for free online): Elk Island: Managing a Sanctuary and The Great Buffalo Saga. All photos of wood bison handling at Elk Island (2015) were taken by Scott Mair and can be viewed on his Flickr page. Check out the newspaper and image sections of Peel’s Prairie Provinces, the University of Alberta’s extensive online archive of digitized Western Canadiana, for even more items related to the history of bison in Canada.